This is Part 3 of a series. You can start with Part 1 and Part 2. After welding up the basic frame of the Labyrinth game, I took the entire thing outside and gave it a quick coat of primer, so it wouldn’t rust. I knew this project was going to take a while, and I didn’t want the rust to get out of hand while I took my time. Sorry for not snagging a photo of the process. Painting is usually messy enough that I don’t like to get my fingerprints on the camera. The next thing I did was create the pivot points for the see-saws. I knew which size gears I needed to use and drew up a frame that would fit around that. To brace it, I ran a piece of tube back down to the frame of the labyrinth. 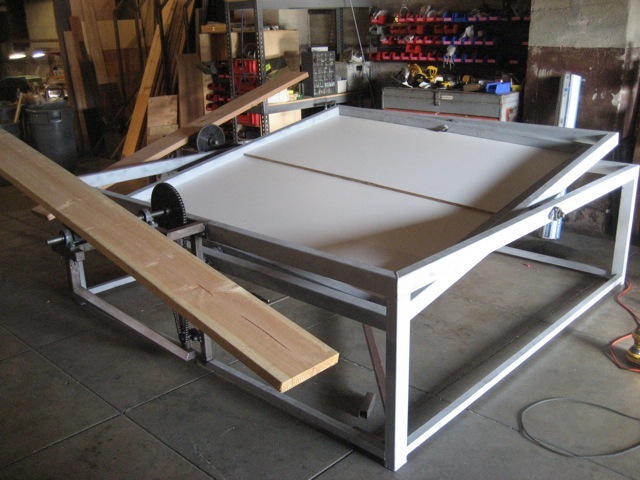 Each pivot point/see-saw mount is attached by only three bolts, making it easy to disassemble for storage or travel. The entire contraption is going to be big, but I might as well make it as easy as possible. When the see-saw goes back and forth, the sprocket will be pushing and pulling a chain. That chain will be turning a sprocket on a driveshaft down below, so the power can be sent to the middle of the labyrinth. I then started on the frame in the middle. 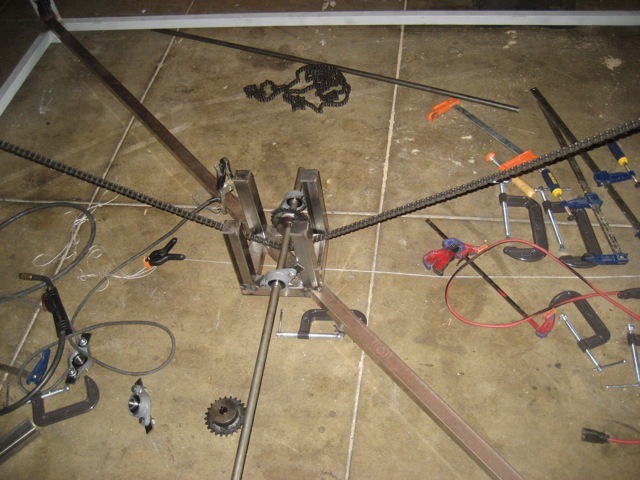 This mechanism is basically a bit mounting point for the chains that will be controlling the labyrinth’s movements. 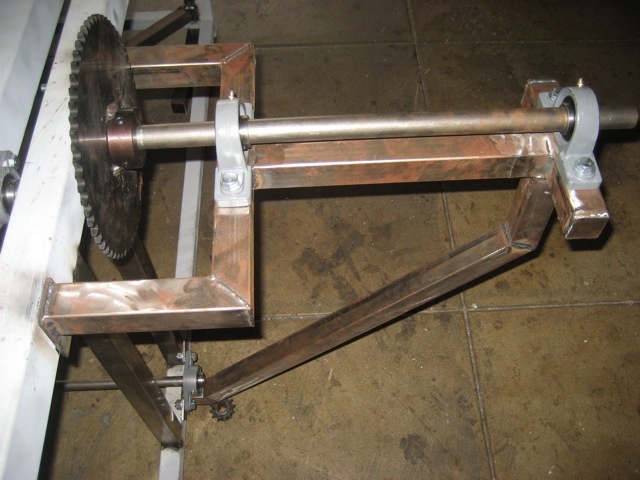 The X driveshaft and Y driveshaft overlap a little bit in the middle of the mechanism, so one is higher than the other. Bearings are used on each side of where the final sprocket will be, so the shaft will be as stiff as possible where it needs to be. 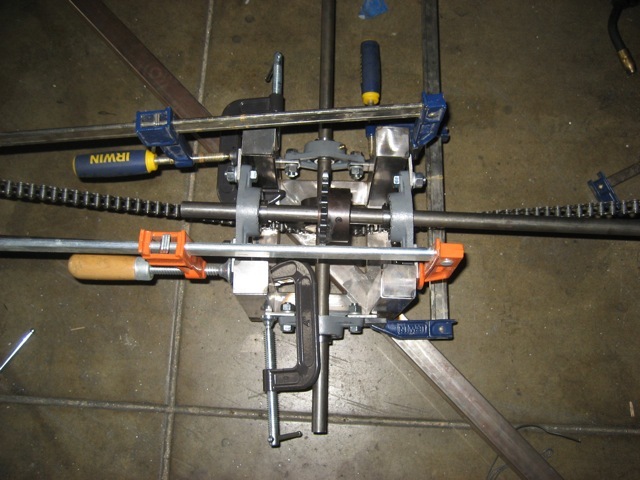 I used clamps on the bearing mounts so I could test everything before doing the final welding. It’s easy to get things out of alignment, and it’s not a lot of fun “un-welding”. This way, I can test and align everything before I fully commit by welding it in place. It’s also fun to have a big happy mess of metal, bearings, chain, and sprockets to play with. I welded on some tabs and bracing for the wood pieces that will fit inside the labyrinth. I forgot to take some decent photos of them, but they just hold up the 3/4″ melamine boards that the ball will roll around on. I also attached some pieces of 2″x10″s to be the actual see-saws. This definitely helped me visualize just how big this crazy contraption will be. I connected all of the chains and sprockets and gave this thing a test. I had to tweak some of the gearing by changing the sprockets out, but I made sure that they would be easy to swap out for exactly this purpose. The final, Part 4, will be out very soon!